If your life is full of debts, one of the toughest decision to make is to whether to file for a bankruptcy or not, because there is a chance that you can lose precious possessions that are in your name, like real estate property or your vehicle. Your car is one of your most important assets as it is your means of transportation. Without it, you will not be able to fulfill your schedule as fast as you normally do, which can affect your ability to receive income to pay off your debts. In the case of your home, it is a priceless asset to lose, because if you do, getting the money for a new one in a middle of a bankruptcy filing is incredibly difficult to achieve. In order to keep your car, first you have to ask yourself if you want to file a Chapter 7 or Chapter 13 bankruptcy, how far behind you are in your car fees and if your car’s equity is exempted. Bankruptcy laws were made to help you get back on track after having financial problems, but thinking what to do to survive can be tough with no guidance and support. For more information, My AZ Lawyers in Arizona is always ready to assist you with any questions you may have, our bankruptcy lawyers can help you plan every step of the way if you want to file for bankruptcy. Overall, filing a Chapter 13 can offer more exclusions for your car than Chapter 7, but filing the latter can help you find a way to also keep it. We mention this because there is a really good chance to keep your car if you owe more than the value of your car, or if you are still paying for it in monthly fees. Your Phoenix bankruptcy lawyer near me will assist you with all these processes so you should not worry about it. Don’t forget that if you keep your car, the payments for it will not go away and you will still need to clear your fees to prevent your car to be claimed. Chapter 7 sometimes can help you reduce most of your debts while giving away your nonexempt property, which your trustee will sell and use the profits to pay your creditors. Keeping your car in chapter 7 will largely depend on its equity being exempted and in your ability to keep your payments cleared each month. HOW DO I KNOW IF MY VEHICLE EQUITY IS EXEMPTED? In short words, equity is the market value of your possession minus the value of its loan if it has any; when it reaches a value significantly more than your local state vehicle exemption rate, it will instantly be up for sale. After the transaction is made, a portion of it will go to you, and the other one will be used to clear up your debts. If the value of your car is less than the loan, that means the equity is exempted. WHAT IF I CAN’T KEEP UP WITH MY CAR PAYMENTS? Well, that is bad news because if you don’t fulfill the agreement you made when you took a loan to purchase your car, it will be lost immediately unless you arrange another payment plan with the entity that offered you the loan. You can also keep your vehicle if you and your lender sign up another contract, using this opportunity to change the terms for your benefit, but if you don’t manage to fulfill what you sign, it will get you into serious trouble. 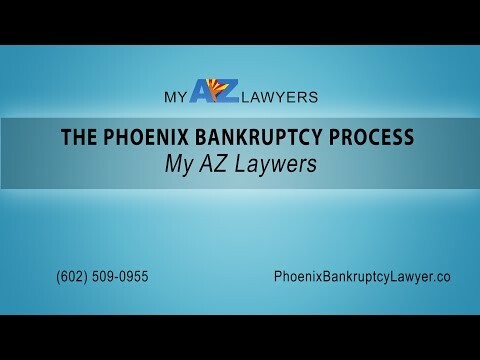 Don’t hesitate to ask My AZ Lawyers in Arizona for help regarding this topic, we know it can be really tedious to learn about this, but our Phoenix bankruptcy lawyers will guide you through every facet of the process. CAN I KEEP MY CAR IF I FILE A CHAPTER 13 BANKRUPTCY? Yes, you can. Actually, it is sometimes easier to keep your automobile with Chapter 13 than chapter 7 if the equity is substantial enough, or if you are behind on your monthly payments. Chapter 13 bankruptcy will help you keep your belongings and re-organize all your debts so you can pay them in monthly plans for an agreed period of time, letting you also keep your vehicle as long as you fulfill the loan payment, and if not, you may be able to use chapter 13 to re-arrange your expenses, reducing them in certain circumstances. When you need a relief from debt, filing for bankruptcy might be your only solution. My AZ Lawyers has your back, with our experienced bankruptcy lawyers that will help you through the process. You don’t have to deal with your situation alone, give us a call and ask us any question about our services.